This week, food writer Alexandra Gill of the Globe and Mail stopped by the West End to visit some of our hidden Italian gems. Gill’s review of small Italian restaurant Amici Miei on Denman Street was particularly glowing and is reposted below. Owners Marcella Gentile and Manrico Serpente (the chef) are from Abruzzo, near the Adriatic coast in central Italy, where they owned two restaurants in the city of Teramo. After losing almost everything in the economic downtown, they moved to Vancouver, where Ms. Gentile lived in the 1970s, to join her brother and their eldest son. The 26-seat room is a humble affair, with tables squished up right next to each other and clichéd photographs of Italian scenery hung on the walls. The service, while warm and friendly, can be stretched thin when the restaurant is busy. 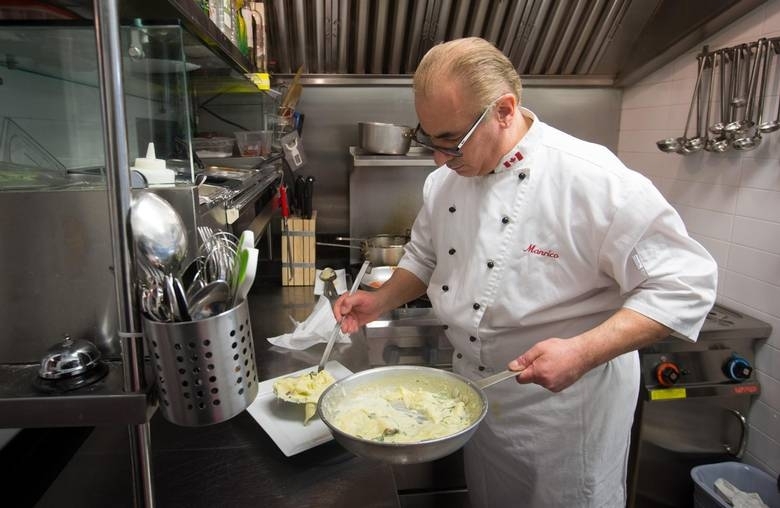 And because everything is prepared fresh – even the pasta is cut to order – the food comes out very slowly. The pillowy soft potato gnocchi reminds me of my childhood. Not my Italian mother’s cooking – she was a hard-working career woman and a horrible chef in those days. 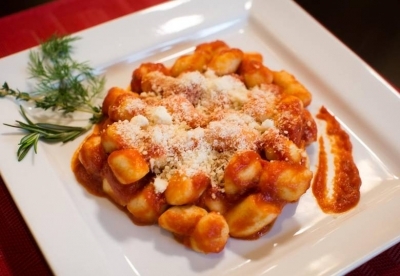 But of gnocchi Sundays at Zia Concetta’s, when the entire family would sit around the kitchen table hand rolling little dough balls on ridged wooden boards. The spaghetti pomodorino transports me back to Italy, to an outdoor café in a cobbled courtyard. The dish is so simple – just cherry tomatoes, softly sautéed in peppery olive oil with a touch of garlic until they burst, lightly scented with torn basil and sprinkled with shavings of salted ricotta. But the simplicity is its genius – along with the purity of the pasta, hued deeply yellow (because it’s made only with semolina and good farm-fresh, orange-yolk eggs), cooked perfectly al dente and swirled into a thick, pony-tail-like bun on the plate. I sighed aloud while devouring this spaghetti chitarra (a generous 135-gram serving, cut into square strings) and swore I could almost smell Italy’s dusty hills and azure-blue seas spilling out from an archive of fond memories. The chitarra spaghetti is a speciality of Abruzzo. The restaurant offered more regional dishes when it opened. But the customers didn’t appreciate them, which is a shame. I hope the owners bring back the scrippelle ’mbusse (an Italian crepe rolled with pecorino and served in chicken broth). If you go, do me a favour and give them an encouraging nudge. Ms. Gentile’s sister-in-law, who is also an owner, is from the Amalfi coast. So, there are some Mediterranean influences on the menu. 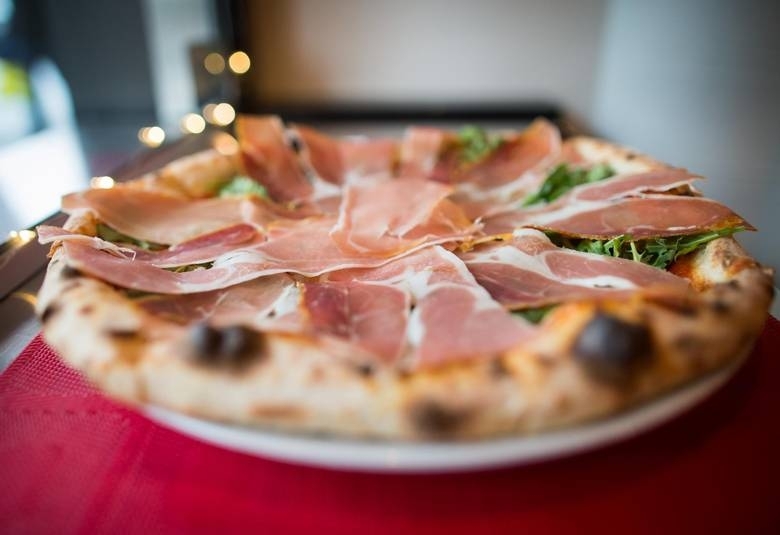 The pizza, although not cooked in a burning-wood stove, is a good rendition of Neapolitan pizza with a thin crust, yeasty dough and grippingly acidic tomato sauce. Mr. Serpente has a masterful light touch with seafood. As a special one night, he made paccheri (a large tube pasta) in a tomato sauce that was chock full of firm, squeaky shrimp and barely opened clams and mussels. 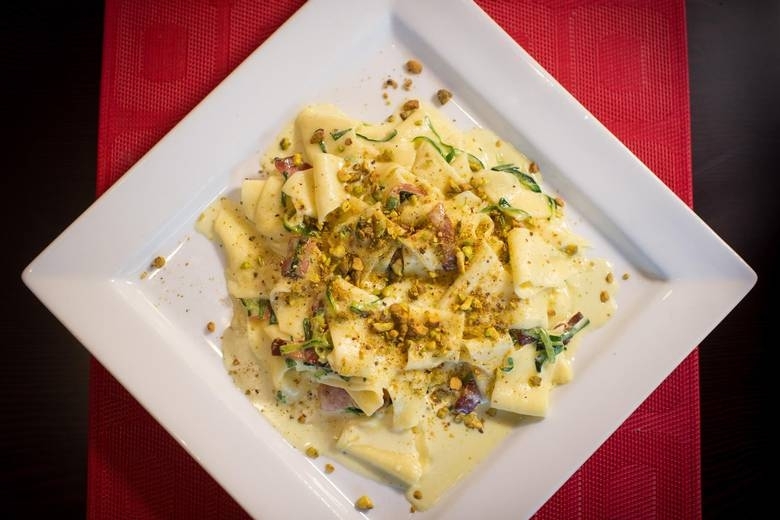 He also makes a glossy Sicilian-inspired cream sauce with Italian pancetta, zucchini and crushed pistachios. Some people might it find it too rich and sweet for their tastes, or maybe just too different. But to me, the difference is the joy of this wonderful little restaurant, which is currently being assessed for the Ospitalita Italiana certification of authenticity. It’s familiar, but new; serious, yet warm and welcoming. It reminds me of home, while taking me far away. I just love it and I hope you do, too. Review by Alexandra Gill; photos by Darryl Dyck (Globe and Mail, March 2016).